Shareagift goes to Google Campus! Google Campus is outrageously cool. 1. The plants at Google Campus can tweet. No joke. They’re attached to sensors that send out a tweet when they need water, when they’ve got sunshine, when they’re happy, sad, lonely, depressed, sexually-frustrated* and goodness knows what else. 2. They’ve got a ‘Dungeon’. Yep, know that archetypal, pitch black, cave-like environment we all assume developers love to hunker down into furiously tapping away at their keyboards for days on end without interruption? Well, they made it. And it’s awesome! 3. They actually launched a real rocket at their launch party. Had it made specially. Beat that. Contrary to what you might think, Google Campus isn’t just a wicked office for Google. It’s a tech hub – to encourage startups and entrepreneurs, young, bright guys with great ideas that need a little help, young companies that need desk space, meeting rooms, event space, and all the other stuff that can be hard to come by when you’re bootstrapped and starting out. As Head of Campus, Eze Vidra, put it to us, “If buildings were like software, Campus would be an open source building”. 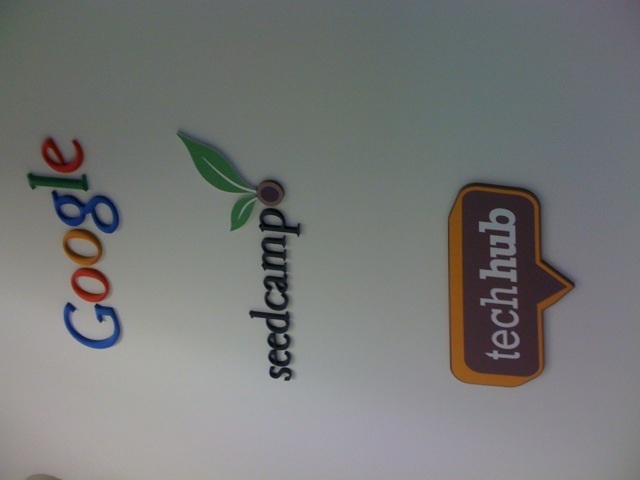 So, I should stop writing this like an ad for Google Campus….! Shareagift were lucky enough to be invited by the great guys at Roomify to come and visit Campus, to take a look around, chat to some of the startups working there and meet some of the guys from Tech Hub and Seedcamp who were wicked. Massive shout out of thanks here especially to Philipp at Seedcamp for giving us some great advice, and Rosa and Amanda at Tech Hub for listening to me blabber on about Shareagift forever and a day – and promising to use us for birthdays and presents and stuff around the offices – I’m holding you girls to that! We think the London startup scene is a super exciting place at the moment. There’s a ton of stuff going on if you know where to look for it, and it’s a community that’s open, inviting, interested and excited for your business to take off. Eze told us he originally started working in the tech community in San Francisco, where things are really inter-connected. It’s his vision to bring some of that network-ethos here. Well, if the sneak peek we saw is anything to go by, it’s a fantastic vision, and they’re making it happen. We were really inspired bout our visit today – being surrounded by visionary people doing something different is a truly awesome motivator. So a huge thanks from us to everyone involved. Thank you Kavan for inviting us. We’re gonna go to bed tonight itching to get going again tomorrow. Previous PostShareagift is set Free! Next PostShareagift accepted to Seedcamp!